SecurDisc 4.0™ is an innovative technology which provides data protection and content access control on media through an optical drive-software combined solution. With the ability to store data redundantly and digitally authenticating data, SecurDisc™ provides professional and private users with the means necessary to protect and share data securely. The encryption technology used is AES-256 bit and AES-128 bit technology (Advanced Encryption Standard). To decrypt, the user must enter a password in a program which will be transmitted encrypted to the drive where it will be decrypted. This method is more efficient and this more secure than a purely software-based solution. Password authentication via the drive. Digital Signature can be applied to all data to allow recipients to verify data authenticity. Checksums are stored on the disc to verify data integrity and readability. Maximum data reliability via redundancy storage and defect data management system. How do I retrieve data from damaged discs? I want to be able to retrieve my files if a disc is accidentally damaged. After you've copied all your files onto a disc, SecurDisc uses the empty space to add redundant and checksum data. This significantly increases the chances of your files being retrieved, even if the disc itself is damaged. 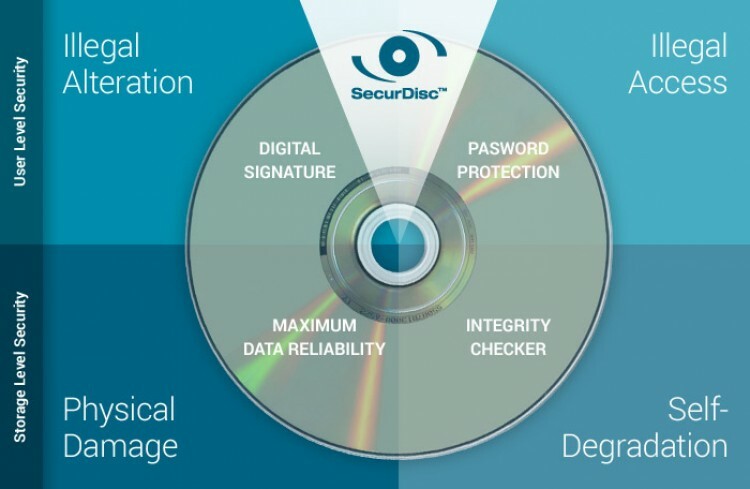 SecurDisc significantly increases your chances of retrieving data from damaged CDs, DVDs or Blu-ray Discs, regardless of scratches, age or deterioration with Data Reliability. When you record data to optical media, the discs rarely fill up to their capacity and a substantial amount of space remains unused. SecurDisc's Data Reliability feature is included with every burn and efficiently stores multiple versions of the information in the remaining space to safeguard your files in the event that your disc gets damaged. How do I prevent unwanted access to my files? I have confidential data I want to keep away from prying eyes. SecurDisc allows you to create a password-protected disc, meaning that anyone wanting to view the contents of your files and folders must enter the correct password in order to do so. Since you set the password and you control who receives this password, you can feel safe knowing that access to your critical information is restricted. SecurDisc ensures the protection of confidential data using AES-128, an encryption standard used by banks and the U.S government. This high security level algorithm prohibits access to the protected data without the password set by the original author. Protected data can only be accessed when entering the correct password in SecurDisc Viewer. The password length recommended should be at least 16 characters long. Complete sentences can also be entered and with AES-128 encryption, it has added security. How can I preserve my important data over time? Knowing that discs decay over time or can be scratched, I want to ensure that the family photos and videos I record to CDs and DVDs are preserved for years to come and don't become unreadable. 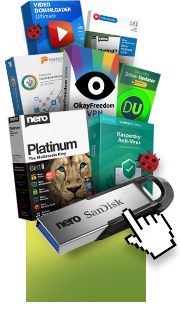 While nothing can prevent disc decay, SecurDisc can save your data by notifying you that it is in danger of being lost forever, giving you time to back it up to another disc. SecurDisc provides another layer of protection through its Data Integrity Check, which warns you if your disc data is at risk of deteriorating, giving you time to back up your files to another disc. The Data Integrity Check feature is always enabled for security, and utilizes a special checksum algorithm to detect errors on discs and then alerts you so your data is always safe and restorable. How can I transfer sensitive data? I need to securely transfer highly sensitive, confidential information to another party, and I want to be confident that even if I lose a disc, the information will remain secure. SecurDisc lets you sign a disc to ensure that the information is valid and has not been manipulated in anyway. A doctor, for example, can digitally sign confidential medical files, and then distribute a public key to the disc's recipients. The recipients can then use the key to verify the authenticity of the disc's contents and ensure they are receiving accurate, non-tampered data. When you transfer important data from one person to another, the recipient must be able to tell that the data is authentic and has not been altered. SecurDisc lets you digitally sign an entire SecurDisc disc using a trusted signing key. Create an encrypted digital signature directly from the application and then distribute to anyone who receives the disc. This allows them to verify the authenticity of the data using the digital signature as a unique verification key. How can I ensure that my burned discs are reliably burned? I want to be able to send discs to family and friends that will play back perfectly. Go beyond just burning with SecurDisc Surface Scan, which offers additional reliability of burned optical discs. Surface scanning checks the surface of optical discs for errors, such as scratches, and gives a quick assessment of the disc surface condition immediately after burning. Surface Scan can be included with every burn to ensure your discs are error free before storing or playback.